Open up the sketch of the bee inside photoshop then create a new layer above the background layer, label this new layer “White Layer”. The white layer will basically just be a blank screen so we can trace over the pencil lines. Select the “Paint Bucket Tool” (G) then fill the “White Layer” with the color white #ffffff. Create another layer above your “White Layer” then label this new layer “Line Art”. This layer will be used for us to sketch out the bee onto. Finally select the “White Layer” then set the opacity to around 50%, you might have to adjust the opacity here and there as we go around tracing the original image. Were now ready to start tracing our lines, select the “Brush Tool” (B) then from the options bar at the top select a 4px hard mechanical brush. Now select the “Pen Tool” (P) with the following options. Select an area of the image you want to start work on first then zoom into that area with the “Zoom Tool” (Z). Make sure your “Line Art” layer is selected in the layers window then begin to draw your path following the lines on the original drawing. Some parts of the image you might struggle to trace all in one go, so just take your time and trace it abit at a time. Once you’ve added some anchor points right click on your canvas and select “Stroke Path” from the menu. Before adding the stroke make sure the color black #000000 is set as your foreground. Once the stroke has been added to your layer right click once more and select “Delete Path” from the menu. You should be left with a 4px line where you added your anchor points. Now continue this method until your have traced the whole image, parts that are colored in black are filled using the “Paint Brush Tool” (B). When tracing the veins on the wings change the brush size to 2px. Once the whole image is colored in you should have something like this. Hide your “Original Layer” then raise the opacity of the “White Layer” back to 100%. Now select the “Magic Wand Tool” (W) with the “Line Art” layer selected select the body areas. Holding down the shift key will allow you to make multiple selections. Now that the selections are active create a new layer underneath the “Line Art Layer” and label it “Body”, then before filling the selection we need to expand the selection. To expand the selection go to “Select > Modify > Expand”, expand the selection by 1px then fill your selections with the color #e2e000. Finally deselect the selection by press “Ctrl + D”. Remember to expand the selection everytime you fill a selection, if you don’t you might get white lines around your colored areas. Now add a “Inner Shadow” to the body layer using the settings below. Create 3 new layers underneath the “Line Art” layer, label the 3 layers “Eyes”, “Eyes 2” and “Eyes 3”. 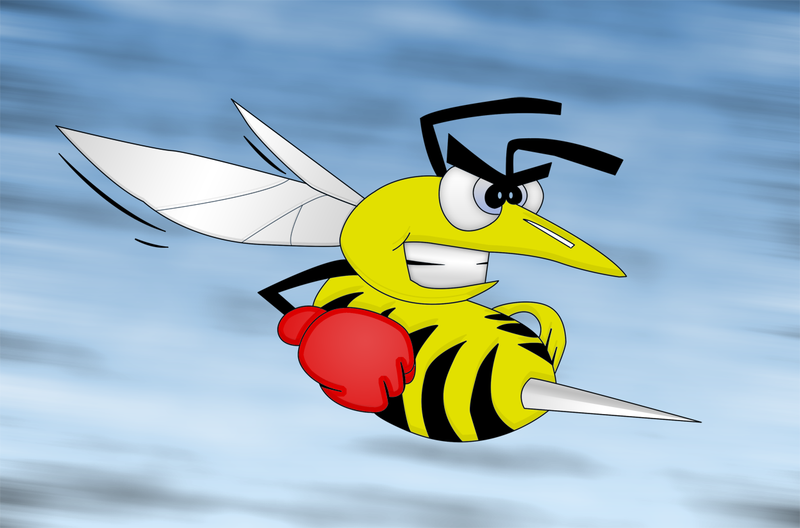 Now select the “Magic Wand Tool” (W) then select the “Line Art” layer, with the “Line Art” layer selected make a selection on the bee’s pupils. Once the selection has been made select the “Eyes 3” layer then select the “Paint Bucket Tool” (G). 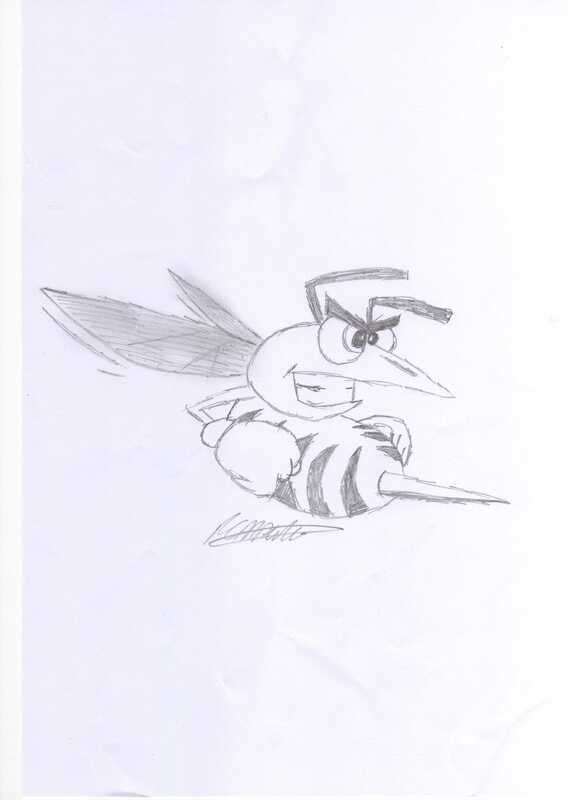 Fill the bee’s pupils with the color white #ffffff. Now select the “Line Art” layer again then make a selection around the next part of the eyes again using the “Magic Wand Tool” (W). Once the selection has been made select the “Eyes Layer” and fill (G) the selection with any color. Now add a gradient overlay to the “Eyes Layer” using the settings below. Finally repeat the process for the last part of the eye, only this time add the following layer styles. Select the “Line Art Layer” then make a multiple selection on the wings area using the “Magic Wand Tool” (W). While the selections are active create a new layer underneath the “Line Art Layer” then label the new layer “Wings”. Fill (G) the selections with the color white #ffffff then add the following layer styles. Select the “Line Art Layer” then make a selection around the teeth using the “Magic Wand Tool” (W). While the selection is active create a new layer underneath the “Line Art Layer” then label the new layer “Teeth”. Fill (G) the selections with the color white #ffffff then add the following layer styles. Select the “Line Art Layer” then make a selection around the sting using the “Magic Wand Tool” (W). While the selection is active create a new layer underneath the “Line Art Layer” then label the new layer “Sting”. Fill (G) the selections with the color white #ffffff then add a gradient overlay using the settings below. Create another layer this time above your “Sting Layer” label this new layer “Sting Shine”. Now make a selection across half of the sting. Fill (G) the selection with the color white #ffffff then add a layer mask. Once the mask has been added drag a linear gradient from the top of the sting down towards the bottom. Finally select the “Line Art Layer” in the layers window, then select the “Magic Wand Tool” (W). With the “Magic Wand Tool” (W) selected make a selection around the glove. Create a new layer underneath the “Line Art Layer” then label the new layer “Gloves”, while the selection is active fill (G) the selection with a deep red color #db0000 then add a inner shadow using the settings below. Now remake the selection around the glove, then create a new layer above the “Gloves Layer” and label the new layer “Gloves Shine”. Go to “Select > Modify > Contract” then contract the selection by 20px. Fill (G) the selection with the color white #ffffff, you should have something like this. Add a layer mask to the “Gloves Shine Layer” then drag a radial gradient from the middle of the glove outwards. Set the opacity of the “Gloves Shine Layer” to 28%, you should now have something like this. Create a new layer above the “White Layer” then label the new layer “Background”. Reset the background and foreground colors (D) then add the clouds filter “Filter > Render > Clouds”. To the “Background Layer” also add a motion blur using the settings below “Filter > Blur > Motion Blur”. Finally add a gradient overlay to the “Background Layer” using the settings below. Wow, final result is really very awesome…! Of course this is a real tutorial for all designers. Thanks for this tips. i what to start digital painting in Photoshop and what an introduction. I will be your fan from now on. Cheers to this good job. for the first time in my life, my best tutorial to find on web. Richard Carpenter i love you man, this work says you are not jealous, like other guys tutorial’s which are not worth following. woww.. keren euy.. I liked it..